Nevada City, Calif. April 15, 2019 – Today, April 15th, 6:00 -7:30 p.m. in the Board Chambers of the Eric Rood Administrative Center, Nevada County Office of Emergency Services presents Situational Awareness, the third in a four-part speaker series. This program is designed to educate and inspire the community to prepare for fire season. Situational Awareness will be moderated by Pascale Fusshoeller, Editor of YubaNet, and will be made available in American Sign Language. The format of the event will enable each presenter to speak for thirty minutes, with the same amount of time available for questions from the audience. Situational Awareness is a term emergency managers, community organizers, and first responders use to encourage people to stay vigilant and aware of their surroundings. 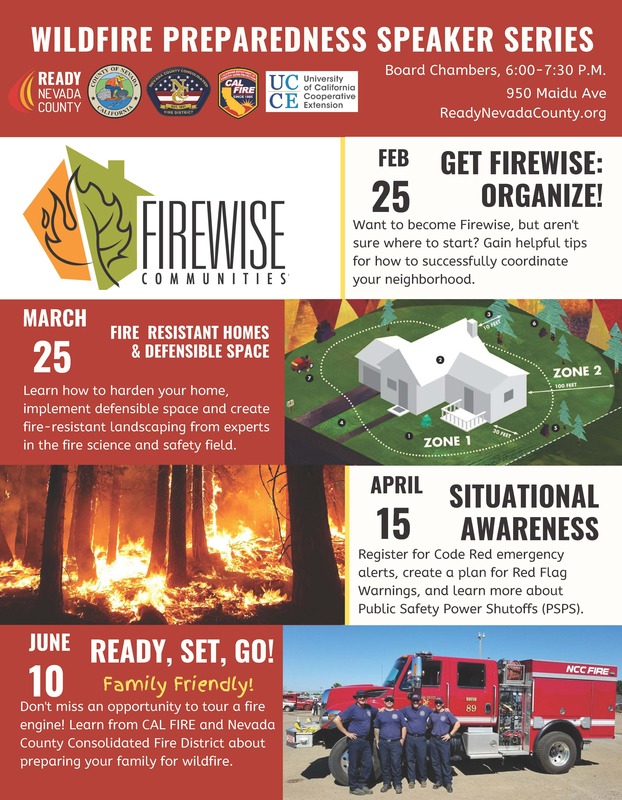 Nevada County Sherriff Captain, Jeff Pettitt who is now overseeing Nevada County’s Office of Emergency Services (OES) as the Emergency Manager, and FREED Executive Director, Ana Acton, will cover the basics of fire preparedness. Pettitt and Acton will also provide specific advice to help the community become more situationally aware. Attendees will learn more about Code Red emergency alerts, the latest advice about Red Flag Warning Days, and how their plan may need to adapt based on time of day, location, recent life changes, and access and functional needs. There is no “one size fits all” plan for emergency preparedness. Nevada County residents are invited to learn how to craft a plan for themselves, refresh an existing strategy for their family, or learn how to help a neighbor or loved-one with theirs. The safety of our county depends on a higher level of engagement with each other, and panelists will be on hand to discuss strategic tips on how to both prepare themselves and educate others. “Getting ready for the height of fire season and creating an emergency preparedness plan requires that each family assess their own unique needs. No two plans will be the exact same,” says Sheriff Captain Jeff Pettitt. The speaker series has been popular among interested community members. Both Get Firewise: Organize! and Fire-Resistant Homes & Defensible Space, the first two installments of the Wildfire Speaker Series, filled the Board Chambers. This program will be live-streamed on the Nevada County Office of Emergency Services Facebook, cable channel 18, and online at Nevada County Media’s website: NevadaCountyTV.org.